Everything you need to know about verbs: regular & irregular forms, conjugations, the tenses, full definitions, and well-written examples that jump-start real use. All the great features of the iPhone version, but made to run on Android. The most complete guide available. Note the above download link will only work on Android devices. The best Spanish language app for serious students. I use it daily in my classes. Thanks for the really awesome app! It really has been incredibly helpful! [And] thanks for the quick response. I wasn't expecting a response at all! Over 2500 verbs, with irregularities in red. Easy to switch between tenses, moods, and imperatives. Definitions are a nice bonus. 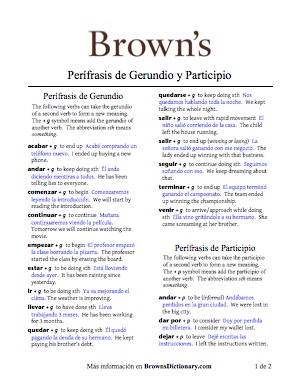 A great companion to the Oxford Spanish Dictionary! Great app! I tend to forget verb tenses a lot when doing homework, so it's nice to be able to look them up when I need to.